Reader Rabbit Preschool: Sparkle Star Rescue! This new “Reader Rabbit” cleverly interweaves innovative activities into an interesting storyline. But here’s the rub: some of those activities presume knowledge that many preschoolers don’t have, and therefore parents will need to help their children through parts of the program. 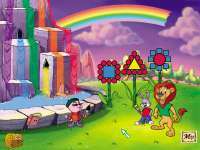 Reader Rabbit and Sam the Lion notice that the stars in the sky have stopped twinkling. Their investigation brings them to the Land of Sparkalot. There they discover that a pirate ship is blocking the top of Mount Brill—the source of all stars. Kids travel around the Land of Sparkalot playing six games to collect Brillites, special stones that can cause an eruption in Mt. Brill strong enough to dislodge the pirate ship. To play the different games, children use skills in sorting and matching shapes and colors, matching letters and sounds, and counting and addition. This software is actually a charming learning adventure for kindergartners. It earned only a 4-star rating because its material is too difficult for its targeted audience.